Social proof is one of the most powerful things a business can do to promote their products. Seeing other successful people grow their business using the same tools you are using can drive you on to more success. Whether you are a blogger, course creator, SEO expert, consultant or just someone who sells your skills online, you will love to see examples of how other people are growing their business so you can learn to do the same. We love seeing OptimizePress being used to build a business. Luckily for YOU, you get to see real landing pages from professional bloggers, who were once in the same boat as you, share their passion and help you get results. Today I want to introduce you to Terra Dawn. 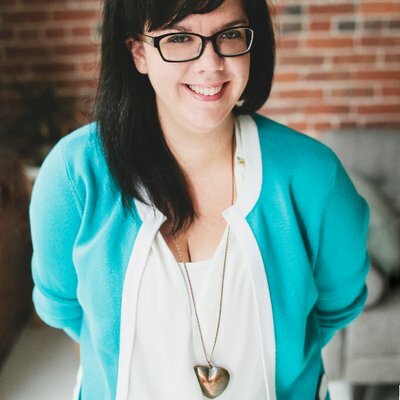 She is a writer and teacher over at Uncork Your Dork, a blog and website dedicated to giving bloggers and biz owners as MUCH information on building an audience and finding traffic as is humanly possible. She’s made it her mission to help bloggers find their platforms, find their fans…and find their success. 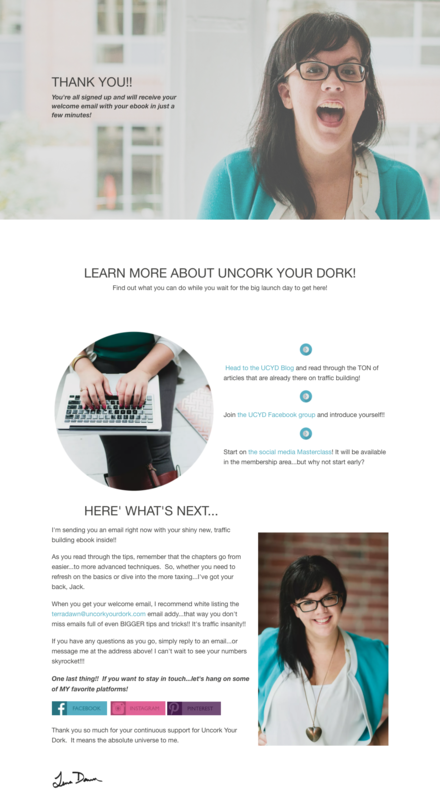 Uncork Your Dork is a place to get your hands on free masterclasses, ebooks, detailed blog posts, planners and more! Before blogging, she ran one of the top Wedding Photography businesses on the East Coast. In addition to shooting weddings in Mexico, Jamaica, Italy and Canada… she taught workshops that were featured in The Knot, Martha Stewart and Destination Weddings and Honeymoons. We grabbed some screenshots of her pages but please visit her blog and learn what she teaches. You’re bound to see some OptimizePress pages. “Torpedo Your Traffic: 40 Unconventional Tips to Increase Your Blog Traffic” – Love this catchy headline! This is an example of her page. You can visit the traffic building masterclass page via her blog. This page also became her Thank You page, a simple clone of the page and some tweaks saves a ton of time. Next is a lesson page of her traffic masterclass. It uses the same template layout with minimal distractions and loads fast. Moving on to another page. 15 Days Free to the “Blogger’s Guide to Traffic” membership site. A really nice sales page! Terra uses clear headlines to describe each area, video to engage with her audience, feature blocks to highlight membership benefits, social proof and call to action buttons that stand out. If you visit her blog and signup to her free training you will come across various other OptimizePress landing pages and thank you pages like this one. I have to admit that it’s a beautifully engaging page and I want to know what she was saying in that camera moment. One thing Terra does incredibly well is getting herself seen throughout her site. Using both video and high quality images you begin to get a feeling that you know her. 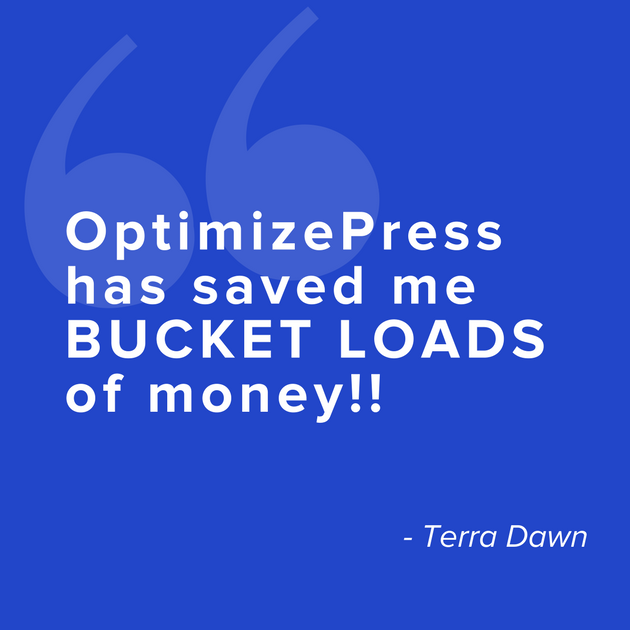 We sent Terra some questions about what she does and how she uses OptmizePress. I’m amazed at all her answers and I’m sure it will be valuable to you all. What other lines of business have you engaged in previously to what you are currently involved in? Before I became a blogger, I ran one of the top Wedding Photography businesses on the East Coast :) In addition to shooting weddings in Mexico, Jamaica, Italy and Canada...I taught workshops that were featured in The Knot, Martha Stewart and Destination Weddings and Honeymoons. What type of hobbies/interests do you enjoy? Reading (I have a fairly extensive library that infests our living and bedroom...lol) and watching cartoons. Currently, I am plopped on my couch watching Last Airbender (the cartoon...not the crap movie) while I work. I'm generally a pretty laid back person, so anything that allows me to CONTINUE being laid back...I'm a fan of. What product does your business provide - what services do you offer? Information. I do NOT do one on one coaching...since I'm an introvert and found that it seriously drains my enthusiasm. SO...instead, I give AS MUCH information to my readers as is possible. In 2017, with the premise of providing AFFORDABLE, organized and easy to consume info, I launched "The Blogger's Guide To Traffic" membership site! Blog posts are thorough...but they make it difficult to give the full walkthrough on social media platforms, SEO, podcasting, etc. SO, the membership site allows me to organize everything in course format! It’s often hard to decide what niche best suits your skills, how did you choose your niche? What was the big “A-HA” moment? Originally, because it's a weird obsession of mine, I was determined to teach SEO to new bloggers. Problem? I started noticing that I kept wanting to branch out and teach readers OTHER traffic related solutions. I took a hard look at the audience that was already following me...and realized they had kinda niched me down already! Instead of niching down on my topic (traffic IS fairly broad, after all) I niched down on my audience! I tend to really appeal to bloggers with a sense of humor, who associate more with the nerd crowd, and who are looking to solve a "stall" situation in their traffic. They need ideas other than the typical "do pinterest", "post to groups" and "write great content" solutions. People assume that you have to be an expert in your field or an industry leader to provide a service. What are your thoughts and advice - what was your level of experience when you started out? I LOVE THIS QUESTION!!!! My personal answer...is NO!! YOU DON'T!!! What you DO have to be, however, is transparent!! When I launched the membership site, I didn't launch it as "I AM THE GREAT AND POWERFUL OZ!!!! I KNOW ALL ABOUT EVERYTHING TRAFFIC!!" That would be silly!! Instead, I launched it more as a "I'm going to be a guinea pig here...and figure out what works and what doesn't! Even better...I'm going to tell you EXACTLY what happens!" When I learn something new and valuable in the world of audience building, I'll create a new course, quick training, live masterclass or download to help members give it a shot themselves! I think approaching something as "an expert" can be beneficial for some...but might ACTUALLY hurt your brand in other situations. Be YOU in your business, and approach solutions with experience...whether it's lack of experience or an insane amount. Do you work alone or do you have a team and colleagues? I have a boyfriend and two dogs. None of which do ANY of the typing. People find it hard to focus - are there any tips you can share on how you avoid distractions? A TON!! I actually have a pretty popular post all about keeping focused. 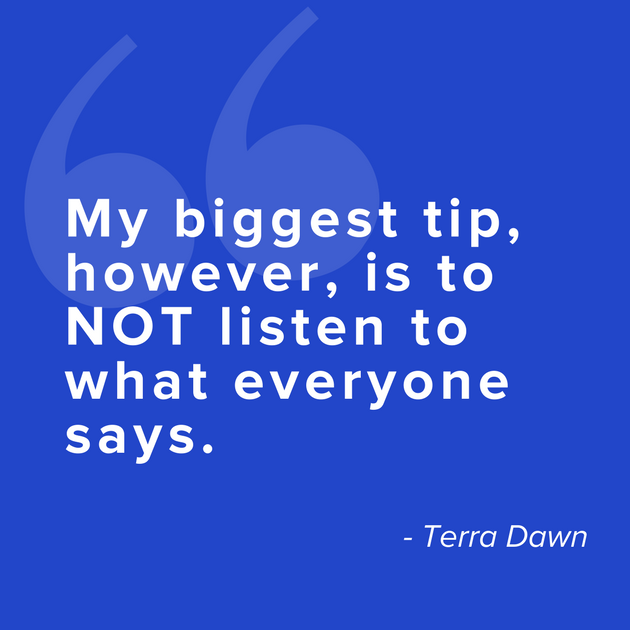 My biggest tip, however, is to NOT listen to what everyone says. I grew up in a typical household, where homework should be done at the kitchen table...with no distractions. Turns out, I'm A.D.D...so I actually NEED distractions to be my most productive!! Some people need white noise to sleep...I need tv to work. Generally, to the irritation of my boyfriend, I will watch cartoons over and over and over and over again. Seriously? Phineus and Ferb are my homies. If I've seen something a thousand times, it gives me the ability to work...and not WATCH the tv. If I DO watch the cartoon...my brain probably needed that break anyway!! If the house is too quiet...my mind wonders and I find myself zoning out. How do you stay motivated and accountable? First answer. Money. I know it sounds crass...and don't get me wrong, proving phenomenally mind blowing content is the cornerstone of my happiness...but I'm 150% money motivated. I want to be able to provide for my family, go on trips, not worry about groceries or rent, etc. THAT is what motivates me. As far as being accountable goes, I actually manage to stay on task with a little brown notebook. One of the hardest things as a business owner is waking up in the morning and feeling like you have a TON to do...but have absolutely NO idea what you should be doing. SO, about three years ago, I bought a little leather brown notebook that I keep in my purse. Whenever I think of ANYTHING that needs to be done, I write it down on today's dated page. What makes it work, though...is every evening I pull out that brown notebook and date the next page with tomorrow's date...and copy EVERYTHING on the list that WASN'T crossed off, onto the new page. This helps me refocus on what didn't get done. I will generally only be able to cross off one or two things from the list daily...but I go to bed knowing what I plan to cross off next! BECAUSE I'm money motivated, if something goes on that list...it better have a monetary return for me. Somehow, that task has to lead to an increase in profits. If not, it can stay on the list until I have time for it. With mindset being a big part of achieving success, are there any books you have read or someone that inspires you that you follow that you could share with us? Oh man....I'm inspired from so many different directions it's ridiculous. (My podcast addiction needs to be put in check). I LOOOOOVE Pat Flynn for his genuine feel. No slime. No sales. Just...here I am. Here's what I have. I hope you love it. I LOOOOOOOVE Ash from Middle Finger Project. Her emails are incredibly inspirational, and I'm a fan of anyone who can be so unapologetically themselves. F bombs and all. I'm a huge fan of Zach Spuckler from "Heart, Soul, Hustle". I feel like he's a master salesman who gets me to buy ALL THE THINGS!!! But he does it in a way that I just LOVE him for. And finally...one of my faves right now is Sam Bell from Brand It Girl. She is SO approachable and a powerhouse after my own heart. I feel like every week she's taking on the giants by launching summits, podcasts and webinars. Her energy and focus is just INSANELY inspirational. I want to be her bestie. In life and in business there are key milestones or turning points, can you pinpoint anything that made the most impact on your business or your success? Easy. I was SORT OF forced into success! After I moved to the DC area about 5 years ago, I lost my passion for weddings...and made the decision to get an easy 9-5 while I figured out what I would do next. It was a "behind the desk, soul sucking" sales job...and I hated every second. BUT, it was great money and paid the expensive rent we'd accidentally locked ourselves into. ($1800 a month for a one bedroom on the water...head/desk). December of 2015...I went into work, only to find out that I was going to need to pack everything up and go right back home. They were closing our branch. I thought we were still OK. Josh had his contract job at Microsoft. I thought this MIGHT be a great opportunity to live on a budget...but focus on the blog I had started a few months earlier. Two weeks later....and two weeks before Christmas, Josh's contract was abruptly ended. We were stuck in a no income, high living expense conundrum. We made it through January with the help of family...and by February, we were pulling in about $1,800 walking dogs through the website Rover.com. My blog was making around $400 a month (which is pretty awesome...considering it was making zero at my previous job). The blog is making about 7 times that now (I pull in around the $5k a month mark...and we are STILL walking dogs through Rover! We use that money for savings, things we WANT, and vacations. BUT, to answer your question, the turning point was the realization that "blogging" wasn't a matter of "do I have time today?" anymore. It was a matter of life or eviction. Growing and maintaining a flow of new customers is the lifeblood of a solid business, what are your main sources of traffic? If you look at my analytics, Pinterest would be the answer. It's a HUGE source of traffic for me! (That answer is PROBABLY not a huge shocker). If you look at the ENTIRE picture, however, I would say it's more "word of mouth". People find the Facebook group because it was recommended to them by another blogger. Folks find my posts because I was featured on another blog or mentioned in a round up, or did a joint webinar. 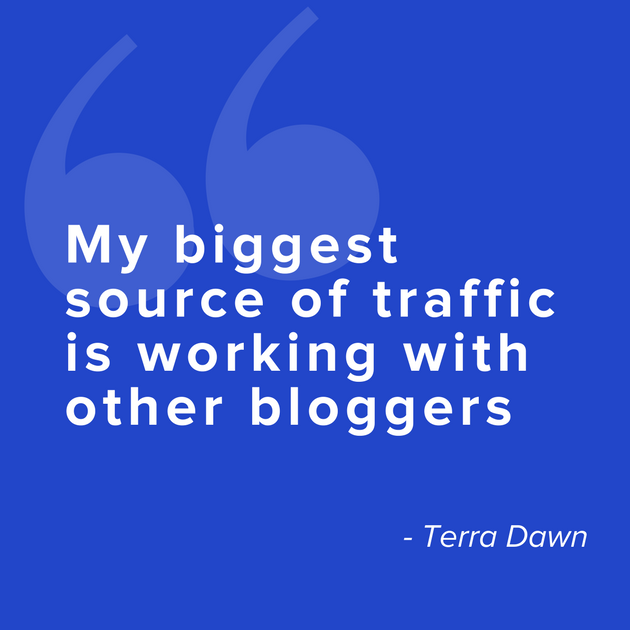 REALLY...my biggest source of traffic is working with other bloggers. I try really hard to give back to my industry...and it's given back to me twofold. You’ve been successful at creating a strong following, what tips can you share with our community on how to stay connected with your audience? I have two answers to this question!! First, I know it's been beaten into the ground, but....BE YOURSELF!!! When you are writing Facebook updates, pin descriptions, blog posts or emails....start working to develop your own voice!! Your voice is one of the BIGGEST extensions of your brand...and it's what will REALLY help to develop your followers. This isn't something you can do overnight! The more you write...the more this will start to shine through. so just practice...and be aware of what your goal is. Secondly, DON'T WORRY ABOUT NUMBERS!!! This is SOOOOOOOOO important!!! I was getting excited emails, sales and shares WAY before I was getting high traffic to my blog. My small group of followers eventually grew, but they started off dedicated to message and ready to download or buy what I had for them. I built an strong trust with a small audience. Collecting leads and making sales is the basic formula for business, can you share with us the funnel you use to move a visitor on your landing page into becoming a paying customer? Believe it or not...I JUST figured this one out recently. I'm a guinea pig for everything traffic, so I'll be the first to say, I've tried it all. The first thing I thought I HAD to have, was a written email funnel. You know the formula: 7 emails....first email "give the download", second email "educate", third email "soft sale"...etc. I KNOW this works for a lot of people, but it just didn't work for me. It took me the better part of a year to figure out that what worked for me...was GIVING away the information. Instead of "asking for the sale", I create Masterclasses, email courses, challenges, blog series, and ebooks...with as much information as I could possibly pack into them. Throughout those pieces of media, I would throw in (where it was appropriate) affiliate links...and of course, links back to my own products. For example, if you download the free ebook "Torpedo Your Traffic" (or read the blog post in full), I give 40 detailed tips for traffic building at all levels! BUT...I can't actually give ALL the information in the book...because that would be longer than War and Peace. SO, I give the detailed tip, and say "If you want to take the tip even farther...check out the 7 module video course inside of the "Blogger's Guide to Traffic" membership site!" aaaaaaand....I link to the sales page. I've found that simply providing value for the sake of value works WAY better than providing value for the sake of money. With OptimizePress you can almost create anything you need, what are your favourite features? SO MANY THINGS!!! I originally used an overpriced monthly company that didn't give me the control I wanted in my sales page. For example, simply getting the different sections flush with the page...without an irritating margin on both sides. So...absolutely complete control over my design. Also, I love the fact that I can EASILY create a masterpiece (either my own design...or an inspired design from other sales pages on the web) and simply duplicate it when I need a new one!! The only thing I need to update are the colors and text. In addition (and I feel like this is the best feature) OptimizePress has saved me BUCKET LOADS of money!! In just a single month, it easily paid for itself and then some. Instead of paying monthly for features I didn't need, I was able to pay once and get that bill out of my bank account. What tips would you give to the OptimizePress community and other OptimizePress users? Find inspiration. DON'T COPY!! But absolutely start collecting screen shots of sales pages and opt-in pages that inspire you!! I save these in an Airtable spreadsheet and reference them when I need a little kick in the creative bum! In addition, pay attention to what YOU click on! If you click a link in a blog post...what made you want to click it. What verbiage did they use? If you're opting in for a freebie...how did they convince you to click? And OF COURSE, figure out WHY you've purchased what you've recently purchased. Pay attention to the sales pages and what made you say "yes! Take my money!". Are there any specific resources you use when building web pages...such as image libraries, icon resources, css tutorials etc (places to get ideas?)…? Airtable, in case you haven't heard of it, is a GREAT free online tool to that allows you to create spreadsheets for holding everything from text to images to videos and more. GREAT for organizing any sales pages or optin pages you become inspired by over time. I find MOST of my page inspiration via emails I get. (Incidentally, I save inspirational emails in Airtable as well.) EVERYONE is selling something these days. So I literally just hunt through my emails to find the "buy now" and "free ebook" type emails! I read through the text, and click the links NOT to buy (although that HAS happened)...but simply to see if I WANT to buy or download. If I WANT what they are offering, I use a free Chrome plugin to take a screen shot of the whole page and save it for later. I REALLY don't recommend reinventing the wheel. Don't add music and crazy video and neon gifs. Sales is a science...so just be aware of what works on YOU. There's a really great chance it's going to work on your audience as well. What hosting provider are you using for your OptimizePress sites? SiteGround. If they were a human being, I would snog their face off every morning before work. SiteGround. If they were a human being, I would snog their face off every morning before work - Terra Dawn Tweet this! Do you prefer using the OverlayOptimizer or original opt-in form? HA!! Tells you how much I still have to learn about The Optimize Press plugin! I actually didn't know this was a thing! SO, as of right now...I absolutely love the original opt-in form! I'll be checking out the OverlayOptimizer this afternoon! What’s your highest converting type of lead magnet and do you have an example? My quickest converting lead magnet to date is a list styled ebook. People want information FAST...and they want it organized. 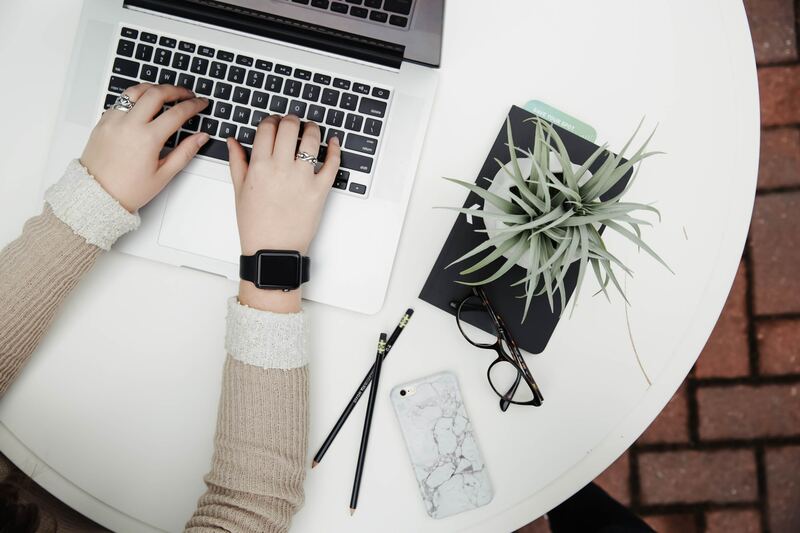 Last month, I wrote an 8,000 word blog post (insane...I know) that listed 40 unconventional tips for bloggers who wanted: traffic to a new blog, traffic free, traffic fast, or permanent traffic for their email list. The blog post was SOOOOOO long, and the information was SOOOOOOO good...that it was a no brainer to turn it into a free ebook. You can see its success in the comment area! The majority of comments there are along the lines of "SO much great information!! I downloaded the ebook so that I could come back to it later!" :). I gave the info up front...but to date, I've had over 400 downloads on the ebook in just the last four weeks. That will only pick up speed as pins and shares get out. What’s your highest converting sales funnel (launch funnel, landing page with email marketing, webinar, etc..)? Money wise, it's probably been the Membership site. I've connected ALL of my major opt-ins to the membership (Torpedo Your Traffic ebook and the 7 Day Increase Your Shares Masterclass)...and the average value of a member is going to be between $100 - $500 (obviously folks can cancel or stay on as long as they'd like...so these numbers will fluctuate as the membership site gets older). On average, the membership site is pulling in around $3,000 a month and growing...so I'd say that's probably been the highest and most profitable product (and sales method) yet!! What’s your favourite app on your smartphone and why? I have two! I'm currently addicted to C.A.T.S., a game where you build tiny robots driven by tiny cats who fight in a battle bot arena. SOMUCHFUN! If ConvertKit ever gets an app...I'm screwed. My phone will NEVER leave my hand. What’s your favourite application on your computer? #1: Kiwi!! Kiwi is a Gmail app I've been using for a while now. It allows me to keep all of my gmail accounts open and on a separate screen on my computer. :D I can check my email with the flick of a wrist and see when a new email comes into my Primary inbox almost immediately. It's REALLY handy. #2: My second favorite is the OBS Project. A TON of bloggers ask about it!! This plugin allows me to record my screen AND my face (PiP style) WHILE I'm streaming to my Facebook group!! I've used this to host 30-40 minute slideshows in the Facebook group kind of like a webinar (but I leave out the sales pitch at the end). What's your favourite piece of equipment on your desk? Other than my computer...I'd have to say it's my bullet journal. I know that's not TECHNICALLY a piece of equipment...but it IS a tool. It keeps my ideas sane and my projects organized. What’s your favourite book? Which book do you recommend that others read? Favorite book of all time? It's a toss up between Peter Pan or Good Omens. :) They both make me smile. A big THANK YOU to Terra for takig the time to give us such detailed answers. Go read her blog and learn to grow your audience and traffic. 3 Examples from OptimizePress customers. Write headlines for your landing and sales pages. 10 Trusted hosting solution for WordPress. Please post your questions below and tell us how you’ve been inspired by Terra. 21 replies to "Case Study: How A Blogger Uses OptimizePress To Build Her $5K A Month Business"
I purchased your OP. Used it once for an article I was using for an email optin page. OK- I understand the social media marketing angle above which is great for building followers and an email list for bloggers and people who offer courses, and all the self help- become a makeup artist, bla, bla, bla, stuff. But what about people like me? I’m a manufacturer that sells direct to the consumer. I have one product, that does one thing. It’s not something I can go on and on about writing how it’s done. It’s pretty simple. It’s got a function and that’s it. I came up with one blog article idea on how i got started, and a lead mag optin article I wrote that few people were interested in I guess, and that was totally on me- I get it. But it was costing me $30 plus a month to have it connected to convertkit, and it wasn’t doing me any good, so I cancelled convertkit. I just don’t know how to apply the principals used in the example above for my needs, which is to sell StandDaddy™. Pat, this is a great question! One I’d love to answer via video or audio as my text will probably be taken out of context. You have a great product but at first a bit confusing what it was (the stand, weights or the clips). I get where you are coming from, single product not much need for content. If I were you I would put efforts into outreach with people who need your products. Find people selling video training courses and reach out offering your knowledge. Try to get on some podcasts in your niche. Run some giveaways with influencers who are selling related courses or products etc etc. Reach out to people who create courses. I think you are right with ConvertKit. I would use a free server like Mailchimp until you needed to upgrade. There is an endless amount of content ideas but I think your effort could be better spent in outreach. Hope that helps in this short reply. Lastly you should probably show more images of your product listing on Amazon or link direct to Amazon. That will show & build buyer trust. How did she widen the template? It’s using much more width than the standard 960px (one of the big limitations of OP pages, IMO). I’ll ask Terra. She may have tweaked the CSS. Haha! I wouldn’t mind my results being as quick as Torpedos! Haha yes i questioned the use of “torpedo” as well. And I see the landing page now says “ignite” instead. This is a great write up. Really good to see how Terra has figured this stuff out and found out what works for her. Thanks for sharing! Thanks Damien! We hope to publish more of these soon. I really enjoyed reading about Terra, her work, and her use of OP. Thanks for sharing. It was fun reading her answers while creating the article. We’ll get her video or audio when we catch up next. Great read. I should get in touch. I’d love to be featured as a case study as well. Email us your site and we can lookover what you are doing. If she was single I would ask her to marry me. Ha,ha…! Seriously I am in process of coming from a pit (not the good one) and working on something as well. I will read more of your stuff and possibly join something. O, and I like your withs and style. By the way I am only 60. I’m creating a video today or tomorrow for newsletter subscribers walking everyone through exactly how I create an opt-in page AND a sales page using OP. :D I’ll send out an email by the end of the week…so just sign up for any of the free downloads and you’ll get notified! HAHAHAHA…I was going more with the “blow your traffic out of the water” kinda torpedo. :D . I’ve definitely updated the verbiage on the sales page…I’m still debating on the ebook. Either way…the content is pretty awesome!! Thanks for the “torpedo tip”, John!! IT’S A DATE!!!! :D lol. You made me blush this morning, Stefan!!! What a great way to start a Monday!!! Hey David, any updates on the new blog design completion? Great case study! This is worth a full workshop. I had so many insights that I had to write down the notepad. I am very grateful to be part of this team of users of OptimizePress.